A great big boost for the beginning of our season from the National Save the Sea Turtle Foundation in Florida! Last night we received a grant from Dr. Larry Wood on behalf of the foundation to support the upcoming St. Croix Leatherback Project season. This great big check will support many volunteers, interns and students, who are working so hard for the conservation of St. Croix sea turtles. This check will provide funding for housing, travel, field supplies and equipment for studies that we are doing this season. 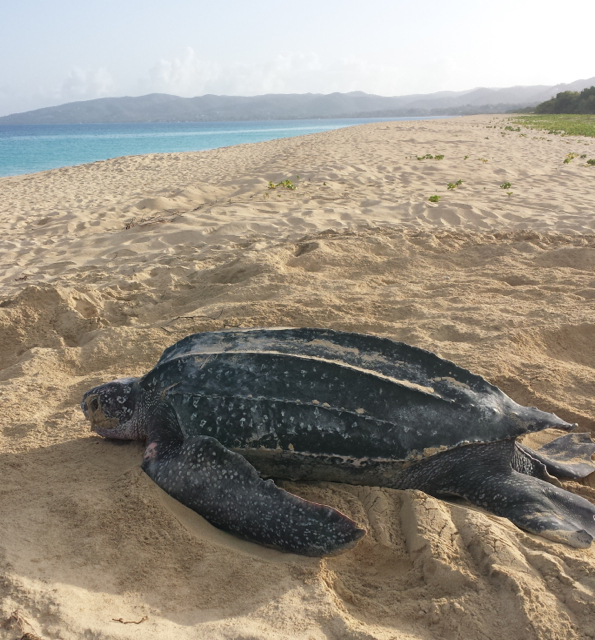 The very baseline of our work is the monitoring of the nesting female leatherbacks, and the protection of their nests and hatchlings at Sandy Point National Wildlife Refuge. We also study nesting and hatching success, look at injuries on the nesting turtles and this year we will investigate the movements of the turtles between nests with a new satellite tracking program. We are very excited for the season ahead! Two new nests in the refuge last night means that things are ramping up for the beginning of April, when we will start nighttime monitoring. Thanks to all of you for following along and thank you again to the donors and members of the National Save the Sea Turtle Foundation for this generous gift! Dr. Larry Wood (National Save the Sea Turtle Foundation) presents a check to Kelly Stewart (PhD, Sea Turtle Census, The Ocean Foundation) at Juno Beach, Florida.